(Nanowerk News) Researchers have developed a technique that might be used to produce "soft machines" made of elastic materials and liquid metals for potential applications in robotics, medical devices and consumer electronics. She and her students are working to develop the fabrication technique, which uses a custom-built 3D printer. Recent findings show how to use the technique to create devices called strain gauges, which are commonly found in many commercial applications to measure how much something is stretching. The findings are detailed in a research paper appearing this week in the journal Advanced Functional Materials ("Direct Writing of Gallium-Indium Alloy for Stretchable Electronics") and is featured on the journal's inside front cover. The paper was authored by postdoctoral research associate J. William Boley; doctoral student Edward L. White; George T.C. Chiu, a professor of mechanical engineering; and Kramer. The researchers embedded liquid-alloy devices into a rubber-like polymer called polydimethylsiloxane, or PDMS, a silicon-based "elastomer." The liquid gallium-indium alloy was used to create patterns of lines to form a network of sensors. "It has some odd properties," Kramer said. "Gallium oxidizes really quickly and forms a thick gallium-oxide skin, which is challenging to work with using typical liquid-processing techniques." However, the Purdue researchers have invented a method that takes advantage of the alloy's oxidized skin. "We exploit this oxide skin by using it for structural stability. 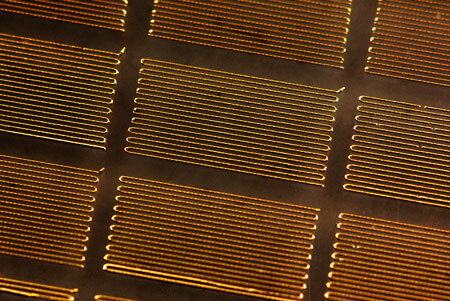 This means you can print liquid on a surface and it will maintain stable structures without moving around," she said. "Once you print it you can flip it over or turn it on its side, because the liquid is encased by this oxide skin. We use this finding to embed our electronics in elastomer without ruining or altering the printed structures during the processing steps." Strain gauges measure how much a material stretches or deforms. Because conventional strain gauges are made of rigid metal film, they can't measure more than a 1-percent deformation before breaking, whereas a soft strain gauge could continue stretching with the material, measuring 100 percent of a material's strain. "What's exciting about the soft strain gauge is that it can detect very high strains and can deform with almost any material," Kramer said. "The skin around your joints undergoes about 50 percent strain when you bend a limb, so if you wanted to have sensory skin and wearable technology that tracks your movement you need to employ soft, stretchable materials that won't restrict your natural range of motion." Findings in the research paper describe how to use the 3D printer to create soft strain gauges. "If you want to achieve a strain gauge device and you want the traces to be a certain width or height, we can tell you with our paper exactly what parameters you should choose, including the flow rate of the liquid, the speed of the stage, and the standoff distance of the nozzle from the substrate. We have created a design strategy for 3D printing liquid metals." The research has shown that the liquid alloy does not readily adhere to the PDMS, whereas the oxide skin does. The findings may enable the researchers to increase this adhesion, a step that could help in the further development of the technique. "Most sensors made from these materials are prototyped individually and limited to the millimeter-scale," said Kramer, who leads the team that created the prototype sensor. "Our process enables digital fabrication of the sensors on the micro-scale. While this is a huge step forward, we need to continue to decrease scale and increase density to develop sensors and electronics that are comparable to traditional, rigid devices and that mimic the functionality of human skin." The new process also can be used to fabricate pressure sensors, capacitors and conductors. Previously, Kramer developed a hyperelastic tactile keypad using the same materials. "It's a sensitive keypad that is flexible and wearable," she said. "When you push on the elastomer it will deform the underlying microchannels, changing the resistance across them." Soft machines could make possible new types of soft microelectromechanical systems, or MEMS. Current MEMS such as miniature accelerometers and gyroscopes found in consumer electronics, automotive airbags and other products are made of solid metals. However, the development of soft MEMS could open up new applications.